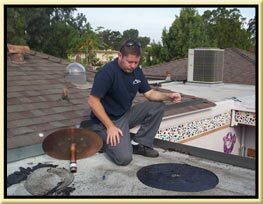 We specialize in roof leak detection and repair. We have infrared cameras and we have some of the most experienced roof leak detection professionals you will comes across. If any of your clients have a leaking roof then you are in the right place. We are roof leak detection specialist and we will find the leak source and repair it for good! We service all types of roofs and offer many repair services such as: professional roof inspection, general roof maintenance and cleaning, flashing checking and servicing, re-coating of flat or ponding roofs, water proofing around air conditioning units, tile roof repairs and much more. Call us today for a free property management roof repair estimate!